Tom Girard, manager of Zane’s Cycles in Branford, Conn., credits a good business plan for strong sales, despite the recession. After a summer of their dreams, bicycle store owners are facing a grim reality this winter. 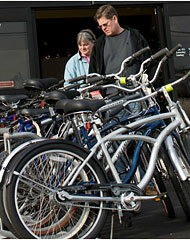 At Zane's Cycles in Branford, Conn, Bill and Karen Fitzmaurice shop for recreational bikes. Big increases in business this year led some shop owners to think that they were largely insulated from a slowing economy. But the economy has continued to spiral downward, taking bicycle sales and much else with it. The question now is whether all the bicyclists who appeared last summer will be back next summer. “This is not like the rest of the recessions we’ve been through,” said Jay Graves, who owns six Bike Gallery stores in Portland, Ore., the first of which his father started in 1974.
Business skyrocketed last summer along with gasoline prices, Mr. Graves said, especially sales of hybrid bikes that can be used for recreation and transportation. So Mr. Graves ordered plenty of cold weather gear for what he believed would be legions of new bike commuters. Summer is high season anyway for bicycle store sales; Christmas sales are minuscule comparatively. And double-digit increases in revenue for the stores last summer only underscored the unpredictability of the business. Industry analysts like Jay Townley, a partner with the Gluskin Townley Group, bicycle industry consultants in Wisconsin, were skeptical even last summer that small bike stores would sustain their surge in the off-season. They said even then that bicycle store owners and managers who had made the same inventory decision as Mr. Graves were misreading the indicators. What owners perceived to be a commuter trend was probably not. The analysts argued that bicycle commuters were generally a fixed group. These riders account for less than 1 percent of commuters in the United States; in isolated pockets like Portland, they might account for about 6 percent. Mr. Townley is even more skeptical now, predicting a flat to slightly down year for small bicycle stores. Declining gas prices are one reason. He also cited major price increases in bicycles and accessories resulting from the rising cost of materials and shipping — 98 percent of bicycles are manufactured overseas — which cut into profits. He said data showed that wholesale sales of new bicycles to shops for the first nine months of the year were down more than 4 percent. “More people riding bikes has not translated into any improvement in bike business,” he said. Since 1999, sales of bicycles in the United States have held steady at about 18 million a year, including bicycles for children, according to data compiled by Gluskin Townley. Counting sales of related parts and accessories, that adds up to about $6 billion a year. In those same years, the number of small specialty bicycle stores dropped to about 4.300 now from a little more than 6,000 in 2000. While those small stores account for only 17 percent of the bicycles sold (the rest are sold by chain stores, mass merchants or on the Internet), they represent about 50 percent of the revenue. The number of bicycles sold may surpass sales of motor vehicle this year, mainly because of the big drop in demand for cars and trucks. The last time bicycle sales were stronger than motor vehicle sales was in the early 1970s, in the midst of another recession, which was set off by the Arab oil embargo. Surveys by Bikes Belong, a group in Boulder, Colo., that advocates more bicycle riding, and Gluskin Townley echoed observations of bicycle store owners and managers that the most pervasive, and possibly the biggest, contributor to the summer bicycle business boom was in repairs. People were dragging long-forgotten bikes out of basements and garages and fixing them up for recreation because they were staying home instead of traveling. Many stores said that they had to hire more mechanics. The most curious development was an influx of bicycles so old that they caused a run on 27-inch tires, once an industry standard but largely out of use since the early 1980s. In interviews, store owners said they had trouble last summer keeping up their stock of accessories, especially bike bags, car racks, tires and tubes. That told industry observers that people were actually using the bikes they had fixed up. At Zane’s, Tom Girard said that in his 15 years as general manager, he could not remember a comparable summer, with business up 30 percent over the previous year. Three months later, he said that business has stayed strong and that his gamble to increase cold weather gear inventory 25 percent was paying off, though at the low end of what he had hoped. An employee he hired in the fall — an unusual time to add a worker in a seasonal business like biking — is still on staff. The experts say surviving in this economic climate means small bicycle stores must choose products carefully to keep inventory low and cash flow high. Mike Hamannwright, a 20-year veteran of the business and co-owner of four Revolution Cycles stores in the Washington area, said he had cut back on cold weather gear even though he saw plenty of stay-at-home people, especially couples, buying bicycles last summer. “Some bike shops are going to go out of business,” he said he had told his staff. “Not every bike shop is going to go out of business, and if we don’t want to be one, we’ve got to be great. “Anybody who was a little weak, this is going to be the crushing blow,” he added. One view contends that the sluggish coda to the summer bicycling boom is not the end of the refrain.